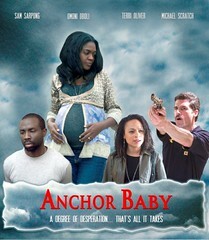 Pregnant Joyce Unanga played by Omoni Oboli and her husband Paul Unaga played by Sam Sarpong are illegal immigrants in the United States. Their visas have expired and their time in the USA is up. They were offered voluntary deportation 3 months previously but refused to take it Joyce has 4 months until she gives birth and has agreed with her husband that they will lay under the radar hiding from immigration until the baby is born. This anchor baby will act as a device for the family to gain legal foothold into the United States;. Joyce isn’t so keen on the idea but her husband Paul is desperate for their child to be born in the United States and have an American passport so that he/she can be afforded the same opportunities as American born kids. After a raid at Paul’s workplace, where Paul drops his phone after running from immigration officials immigration and are hot on their tails and one morning while Joyce is out on her daily walk they pounce and grab Paul. Joyce has no choice but to evacuate the apartment if she too doesn’t want to be caught. She is left alone, homeless and pregnant looking for a place to stay when she comes across a Good Samaritan by the name Susan played by Teri Oliver in a doctor’s office. Susan comes in to save the day and offers her her basement to live in until the baby is born. It sounds too good to be true. Is it? The movie highlights the harsh realities of being an illegal immigrant. It is not an easy life. there is no healthcare for illegal immigrants. You have no ID card or insurance to see a doctor, no ID to rent an apartment. You can not work because you have no work permit. You are seemingly present but more or less invisible. Sometimes resorting to further illegal behaviour is the only way to survive as we see in this movie whereby Joyce and Susan end up visiting a criminal counterfeiter in order to order clones cards so that she can have ID and gain access to public services such as medical attention that most people take for granted. There is no dignity for an illegal alien. When Joyce does turn herself in at the end of the movie she is treated like a common criminal, which she clearly doesn’t see herself as. She is put in handcuffs much to her horror. She pleads with the arresting officer that it is unnecessary as she is handing herself in voluntarily. Her pleas go ignored. The immigration lawyer asks Joyce this question at the end of the movie and I was asking myself the same question, and I’m sure by the end of the movie Joyce was screaming inside HELL NO it wasn’t worth it. I think viewers are less likely to sympathise with Joyce because she wasn’t fleeing persecution or a life and death situation back in Nigeria, On the contrary she described her country as “beautiful” to Susan and talked nothing more of wanting to go back there. So why the desperation for American citizenship? This made me laugh because it is such a Nigerian thing to say. Nigerians always think that paying in cash is like an incentive when in the west it is not an incentive for anything. Mode of payment means nothing and when paying in cash for very expensive items you are likely to get the law called upon you whether your money is legit or not. She then offered to pay the guy even more money than he was asking for upfront, obviously not realising that bribery doesn’t work in the same way in the United States as it would in Nigeria. It was funny that even though Joyce had Nigerian Mentality in one respect in another respect she was totally clueless. Once people in the cinema realised what was really happening in the movie (the twist) there were a few people shouting “mugu” at the screen at her, as if they couldn’t believe a Nigerian woman could be so naive. The performances in the movie were good and solid. There wasn’t anyone that had the wow factor for me except for Omoni. Omoni Oboli was the standout for me. It was an absolute stellar performance. She was passionate and convincing and conveyed a gamut of emotions effectively. I didn’t think Sam’s performance was as good. It was also glaringly obvious that he was not Nigerian as the film said he was so that was a huge miscasting in my opinion. Not to say that the guy was bad but next to Omoni he was coming across as pretty mediocre. Wow what a brilliant twist. I did think of it at the beginning but as the story progressed I didn’t think it would be possible but YES it was! Wow what a brilliant twist. Why didn’t Sam tell his wife immigration were on their tails so that they could run. He was there letting her think that he has been perambulating the streets being useless Say What? The guy was supposed to be street wise. You would have thought that he would figure out that his workplace was going to give immigration his address and take his pregnant wife and RUN! How can a woman that is very obviously pregnant just have had a baby? Susan and Joyce were thinking of every possible thing that could rouse immigration’s suspicions when Joyce was due to leave to go back to Nigeria. Why didn’t they think that that would look suspicious? Say What? It would have been different if Susan wasn’t showing but she was. @NollywdREinvntd awww sorry for you! you really missed out. I'm sure it'll be over there soon though! Where can I go to watch this? @Naija American Girl I watched it in the cinema in the UK. @Sanjahoney Thanks mi dear! Only thing about thes ecinema release movies is that they take ages to come out or they never come out at all, or at least nowhere where I can find em! I wish it would hurry up and hit the U.S.. I look for "Anchor Baby" and "Ije" every week. I can't wait to see them both. I too cannot wait to see Ije! I WANT TO WATCH ANCHOR BABY NOW! NOW CAN I WATCH ANCHOR!!!! This is a great movie with substance. The storyline is amazing and shocking at the same time. I had to watch it back to back again cos I never saw it coming.